[Above L-R] Valencia College’s Director of Community Affairs Executive Director Elisha Gonzalez, Orange County Mayor Teresa Jacobs, Orange County District 2 Commissioner Bryan Nelson and Bill Moss from CBRE at the EDC Insider Update event. 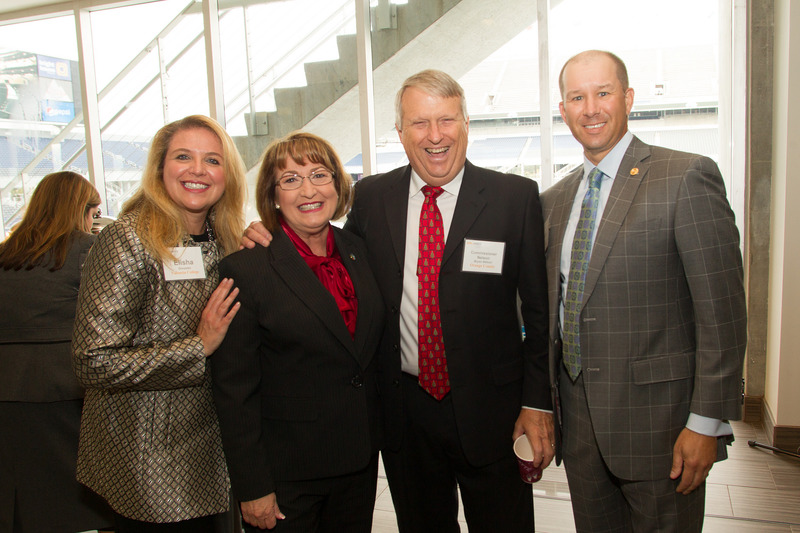 Orange County Mayor Teresa Jacobs joined local investors and business leaders at the Orlando Economic Development Commission’s (EDC) Insider Update event at the Orlando Citrus Bowl Stadium on Dec. 4. The event aims to encourage networking and discussion of economic development strategies and goals for the upcoming year, while providing attendees insight on the future strategic initiatives for the region. While speaking to attendees, Mayor Jacobs highlighted the Orange County Convention Center, and how the County is investing in the center and International Drive as key economic development tool. The Orlando Economic Development Commission (EDC) is a not-for-profit, public-private partnership that attracts, retains and grows jobs for the region. The EDC serves Orange, Seminole, Lake and Osceola counties and the City of Orlando in Florida. Photos from the EDC Insider Update event may be found on Flickr for use by the media.